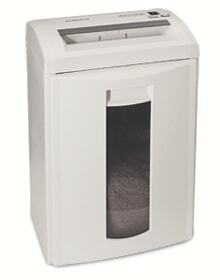 The Formax FD 8250CC Paper Shredder provides high shredding performance in a deskside model. Compact and powerful, it shreds both paper and credit cards, to security Level 4 shred particles. This cross-cut model offers on-the-spot destruction of sensitive paperwork, phone messages and notes generated throughout the day. The removable waste bin features a fill-level window making it easy to see when it’s time to be emptied. Energy consumption is reduced with power-free stand-by operation. The FD 8250CC is ideal for busy professionals or the small home office.